3-Disc GSR Field Kit. 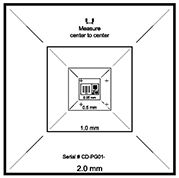 A control disc is added to the two sampling discs to enhance certainty of the analysis. Prod. No. 16256-3. 4-Disc GSR Field Kit. 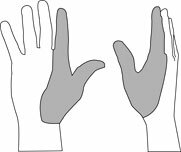 Suitable for sampling palm and back separately on both hands. Prod. No. 16256-4. 5-Disc GSR Field Kit. A control disc is added to the four disc sampling kit to make it compatible with FBI requirements. Prod. No. 16256-5. A complete line of high quality GSR field sampling kits, containing certified SEM pin stubs with double coated adhesive carbon tabs in plastic tubes. 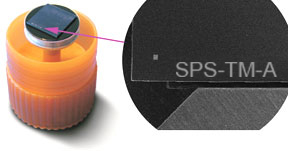 The certified SEM pin stubs have very low amounts of Pb, Sb and Ba, not detectable by SEM/EDX. The caps hold the GSR sample disc for easy and secure GSR collection. The discs are ready to use and the tubes are pre-labeled for the sampling areas. The sturdy transport box is tamper evident sealed. 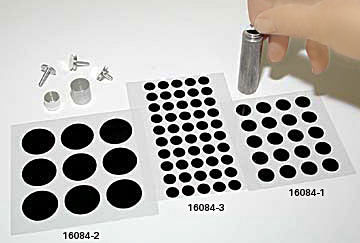 Normal area for taking samples on "subject"
Ten 12.7mm SEM pin mounts in clean, glass storage tubes (25mm OD x 55mm high) held in a compact transport box with labels. 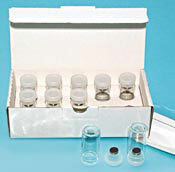 GSR Kit is designed to avoid any contamination of the GSR samples. The Forensic Gunshot Residue Lab Kit is available with either standard 12.7mm pin mounts with 8mm pins (16111) or with the shorter 6mm pins (16111-9). Also available as a lab kit without pin mounts and tabs. Ideally suited for SEM specimen preparation on the most commonly used SEM pin stub, facilitating easy carbon coating for SEM/EDX investigation. The Forensic Field Sampler can be safely stored in the glass specimen vial and can be easily shipped since the cap holds the sampler stub in place. Evidence material is held by the adhesive carbon tab. 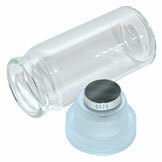 Numbered, certified aluminum mount that has a double-coated adhesive carbon tab applied to hold sample in a clean, glass vial 25mm OD x 55mm high (1" x 2.17"). Packed in a box of 100. Numbers can be chosen as 100 consecutive numbers between 0 and 9999 (greatest numbers). Please inform customer service about the numbering sequence when ordering this product. 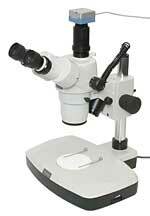 The forensic SEM specimen mount is made of a special certified aluminum alloy. This certified mount does not contain elements which might interfere with the collected GSR evidence. The simplicity of application and smooth, clean surfaces of PELCO Tabs Carbon Conductive Tabs are a significant improvement compared to many of the other common adhesives that have been used in SEM mounting. Both tab sides have a thick conductive adhesive (conductive inner tab is 35µm and the adhesive is 45µm on each side for a total thickness of 125µm [5 mils]) with a liner on both sides, a transparent liner and white liner respectively. They are ready for immediate use. 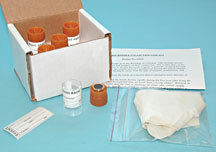 The top protective liner does not have to be removed until the sample is ready to be mounted. This reduces possible contamination. Outgassing is negligible. Application of the tab to a mount or surface should be done slowly and carefully to maintain surface smoothness. The conductive adhesive is a carbon filled acrylic, free of solvents. It can be removed from the specimen mount with ethyl acetate, ethanol, isopropanol, alcohols or our 3M Adhesive Remover 80924 which is solvent-free. Temperature maximum is 60°C (140°F). 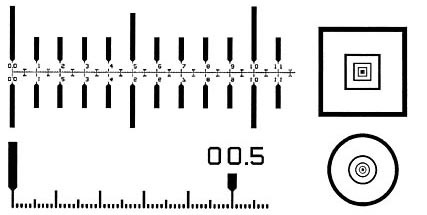 High purity carbon tabs may contain very small impurities of Al and Si; see EDX Spectra. This product may also be used for gunshot residue analysis. Many laboratories use these tabs for SEM in a large diversity of applications. Refrigeration will increase shelf life but a warm up period of one hour is then required before use. The PELCO Tabs consist of a carbon fiber mat impregnated with carbon filled acrylic adhesive. There is no internal carrier film. Back by popular demand, the thicker PELCO Image Tabs is a return to the stiff 260µm (10mil) thick smooth conductive tab. Though not as conductive or sticky as the current 10mil PELCO Tabs, PELCO Image Tabs are suitable as a photographic background and are repositionable. This tab is also suitable for Jet Scan applications where the tab must be removed and archived. The PELCO Image Tab's surface is less prone to bubbling and cracking when metal coated under vacuum and thus better than the 125µm (5mil) PELCO Tab as a photographic background for small particles like pollen and insect parts. Both sides of the 200µm thick conductive polycarbonate base have 30µm thick conductive adhesive. Total thickness is 260µm with a liner on both sides. Protection for handling, storage and shipping is provided on one side by the transparent liner sheet and on the other side by the white liner cover. The conductive adhesive is a carbon-filled acrylic, free of solvents. It can be removed from the specimen mount with ethyl acetate, ethanol, isopropanol, alcohols or our 3M Adhesive Remover 80924 which is solvent-free. Temperature maximum is 60°C (140°F). 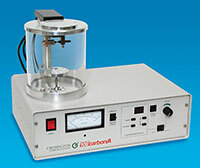 Small impurities of Ni, Cu, Si, Sb, S, Na, P and very small impurities of Fe and Mg can be found. Refrigeration will increase shelf life but a warm-up time of 1 hour is then required before use. Construction and thickness is similar to the PELCO Tabs Carbon Conductive Tabs above. The EDX Analysis clearly shows a higher purity surface for those applications that require critical composition study; only minor impurities of Al and Si may be found. 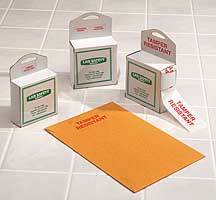 An inexpensive way to safeguard lab shipments, sealed documents or small containers. Once applied these economical, peel-and-stick labels cannot be removed in one piece! Instead, they are formulated to break apart when stressed, giving clear evidence that tampering has occurred. Transparent labels display the words “TAMPER RESISTANT” in bold red ink. 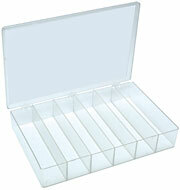 Ideal for use on boxes, bottles, shipping containers, parts envelopes, even file drawers. Comes in a handy dispenser box. Size 5⁄8" x 2-1⁄2" (16 x 63.5mm). 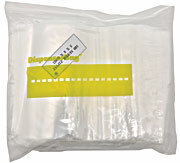 Selection of polyethylene plastic bags with a resealable zip lock. 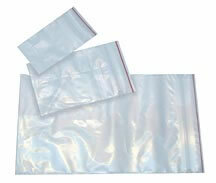 The zipper bags are ideal for packing, storing, shipping, sampling and sorting. The plain zipper storage bags are available in 11 practical sizes with a 4 mil thickness. The write-on zipper storage bags come in 6 practical sizes, they have a white write-on area and a thickness of 2 mil. These bags will hold up in a convection oven at temperatures of 90°C/195°F, remember that the air in the bag will expand during initial heating. Shown with our Specimen Storage Box and DRICAP® Capsule Dehydrators, this barrier bag is ideal for storage of materials sensitive to moisture and/or oxygen. The inside dimension measures 6 x 5.5" with a zip lock and a tear notch above the zipper. The material is a metal foil-covered 4mil polyethylene with a MVTR (moisture vapor transmission rate) that is 1,000 times better than a typical poly bag. It is heat sealable and ziplock resealable. Compatible with vacuum sealers. Shown with our Specimen Storage Box, this barrier bag is ideal for storage of materials sensitive to moisture and/or oxygen. The inside dimensions measure L x H x W (where W is the pouch bottom width) with a zip lock and a tear notch above the zipper. The material is aluminum foil covered multi-layered polyethylene, providing an MVTR (moisture vapor transmission rate) that is 1,000 times better than a typical poly bag. They are heat sealable, and ziplock resealable. Compatible with vacuum sealers. Sizes to fit all your needs. Small 139-311 3-3/4 x 6 x 2-1/2" 4-1/4 x 7-1/2 x 3"
Medium 139-312 6-1/4 x 7-3/4 x 2-1/2" 6-3/4 x 9-1/2 x 3"
Large 139-313 7-1/2 x 8-3/4 x 3" 8 x 10-1/2 x 3-1/2"